The freeform, 300-foot swimming pool at Radisson Grenada Beach Resort has two waterfalls. 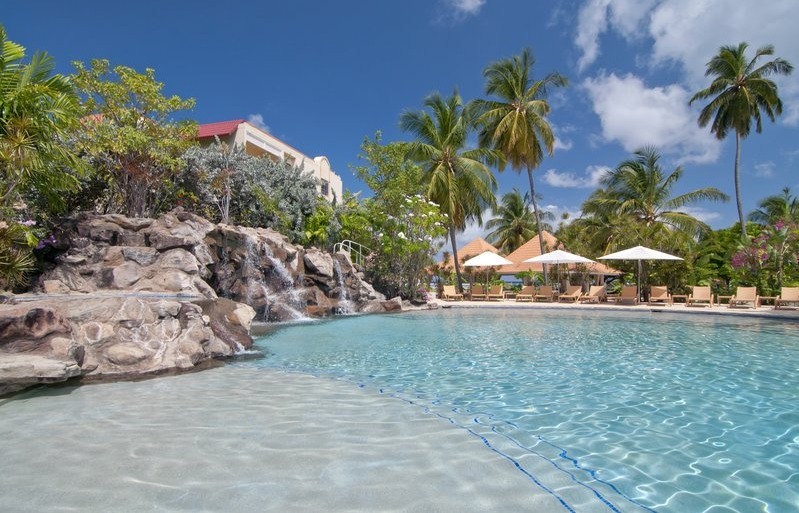 Radisson Grenada Beach Resort is located on Grand Anse Beach and features an onsite PADI dive center, four restaurants and lounges, and a large freeform pool with two waterfalls. The hotel rooms and suites at the Radisson Grenada Beach Resort feature private balconies and patios with ocean views. Other amenities include ceiling fans, pillow top mattresses, coffeemakers, mini bars and room service. Upgrade to a suite for a living area and a balcony hammock. Dining options at the resort include Tradewinds Restaurant for breakfast and dinner, and the Oasis Pool Grill for lunch. Light bites and cocktails are available at The Sunset Beach Bar and the Bamboo Lounge. Activities like water sports, scuba diving and tennis are available at the resort. Fly into Maurice Bishop International Airport (GND), formerly known as Point Salines International Airport, in the parish of St. George’s, Grenada. Radisson Grenada Beach Resort is located about ten minutes from the airport, on Grand Anse Beach. Visit Radisson Grenada Beach Resort’s website for more information.